Britain’s most senior police officer has vowed to protect a minority Islamic sect after the killing of a Muslim shopkeeper in Glasgow.Met Commissioner Sir Bernard Hogan-Howe warned British Muslims that attacks on the Ahmadiyya community would not be tolerated following the death of Asad Shah.The popular 40-year-old, an Ahmadi Muslim, was knifed to death in his shop in what was feared at the time to have been a sectarian attack against the peace-loving branch of Islam he followed. 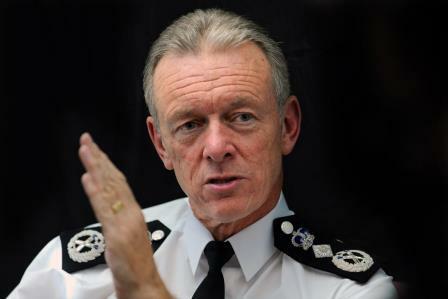 According to the Observer’s Mark Townsend, Sir Bernard was asked about attacks against Ahmadis and said Scotland Yard would ‘robustly police anyone who carries out or threatens violence or, indeed, any other crime’ against the Ahmadiyya community.On Friday, the 58-year-old told worshippers at the country’s largest mosque, the Ahmadiyya community’s Baitul Futuh in Morden, south London, that his officers will keep them safe. Speaking after prayers, Sir Bernard promised to stamp out extremism and intolerance.’The particular reason for being here this afternoon is to stand with you after recent events in Glasgow,’ he said.’A man was murdered, an Ahmadi … and there has been some speculation which has concerned people about why this man was attacked, perhaps because of his faith.’I want to reassure you that we the police are here to look after you, I want to stand by you and make sure you are protected. He added: ‘This country says we protect everyone’s right to have their own beliefs and, provided they don’t hurt other people, they have that right.’No-one has the right to stop you in your beliefs and stop you celebrating your religion in the way you prefer.’You hurt no-one, do a lot of good and promote good things – that’s why we need to protect you.’Mr Shah, 40, was killed at his Glasgow shop on March 24 – the day before Good Friday. Hours before his murder, Mr Shah had written on Facebook: ‘Good Friday and very Happy Easter, especially to my beloved Christian nation.’ Earlier this month, taxi driver Tanveer Ahmed, accused of his murder, said through his lawyer that he killed the much-loved family man because he had claimed to be ‘a prophet’. Mr Shah belonged to the Ahmadiyya community, which promotes peace and tolerance but has been persecuted by members of orthodox Islamic sects in Pakistan.Tanveer Ahmed, 32, from Bradford, West Yorkshire, has appeared in court charged with Mr Shah’s murder. Share the post "Scotland Yard vows to protect minority Muslim group after ‘sectarian killing’ of Ahmadi shopkeeper in Glasgow"